Yeine grew up in the outlying kingdom of the Darre, her mother having been disgraced and exiled from the ruling kingdom of the Arameri for falling in love with a Darre man. So Yeine is surprised when her grandfather Dekarta summons her to the city of Sky, home of the Arameri. There she will join her two cousins as a possible heir to the throne of the Hundred Thousand Kingdoms. Although Yeine has ruled her own Darre people successfully for years, the politics of the Arameri are complex and cruel, and she has to learn quickly, all while hoping to unearth secrets behind her mother’s recent mysterious death. Complicating matters is the presence of the enslaved gods, who have been placed under control of the Arameri ever since they rebelled against the great Skyfather. These gods are powerful, but they are bound to follow the orders of the Arameri. Even Nahadoth, one of the original Three gods, is under the Arameri control. But the gods quickly seek out Yeine for purposes of their own. Who can Yeine trust? And even though she doesn’t particularly want the throne, can she get out of the competition for it alive—and perhaps even help her Darre people in the process? 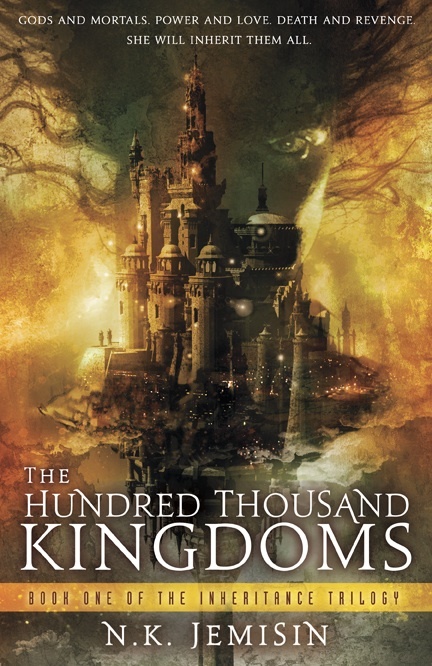 In The Hundred Thousand Kingdoms, author N. K. Jemisin has created a complex and satisfying world with a rich history, religious traditions, and racial diversity. In this book, we only get glimpses of it, but it’s clear that she’s worked out far more than what she reveals. (And indeed, she followed this book with two more novels about this world.) This book focuses on the ruling classes, where the ruthless pursuit of power is the order of the day. To be head of the kingdoms, you must be willing to inflict pain on, and even to sacrifice, those close to you—and pretty much anyone else. Love and loyalty make you weak, yet love and loyalty give people like Yeine reason to fight. Dark-skinned Yeine, half Arameri and half Darre, must prove her own ruthlessness when she reaches Sky, and her background has given her many useful skills. The Darre society is matriarchal. The women fight the wars and rule the people; the men, with their superior strength, are given the more essential task of protecting the Darre homes and children by acting as a last line of defense. When men are called in to fight, the situation is dire. The Darre are also among those who worship the Skyfather by compulsion. Their temples were originally dedicated to the Three Gods, but the windows honoring the two defeated Gods were covered over. The plot, in which Yeine tries to uncover the truth about her family’s history and the history of the War of the Gods, borders on the convoluted but was never too difficult to follow, aside from some bewildering moments toward the end. Yeine tells her own story, sometimes looping back to pick up abandoned threads or appearing to talk to herself. The narrative voice could seem gimmicky at first, but it works well here, partly because Jemisin doesn’t go overboard with it. There are a few character relationships that I was not inclined to appreciate because they seemed too intense too quickly, but Jemisin sold me on them in the end by providing a good reason for the intensity. This is the first of a trilogy, but it stands alone nicely. I’m actually kind of relieved about that because I didn’t know this was a trilogy until after I started it, and I really didn’t want to commit to more books right away. The ending is a full and complete ending, with the major plot threads resolved. The future books, I assume, deal with fallout from these events, but those stories aren’t needed to make this one feel complete. It would be interesting to unspool more of the layers Jemisin has clearly wrapped up in this world, but I don’t feel a need to do that right away. This has been recommended to me, and now I know more about it. The most important thing, as you say, is that it has an ending! I almost didn’t read it when I saw it was a trilogy, but it stands alone very well. This sounds very interesting – and a new author to discover, thanks! I’ve had a harder time with high fantasy than I used to in the last few years, but this was a good one. I was pleasantly surprised to find that my library has this and some of her other books as well. And I’m glad to read in the other comments that I’m not the only one who ends up returning & re-checking books! I loved the idea of imprisoned gods — that was the bit of the book that seemed the coolest to me, even in the midst of a very cool and well-fleshed-out world. The sequel isn’t a sequel sequel, to my mind; more like a Diana Wynne Jones sequel, where some of the same characters are involved and it’s set in the same world, but the book is completely its own animal. I haven’t read the third one yet though. 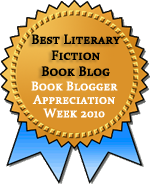 The imprisoned gods were a great idea–it made me think of djinn, and ever since the Bartimaeus books, I’ve been intrigued by djinn. I like the idea of the sequel just being in the same world but also being its own thing. There’s so much more of this world to explore. I’ve picked this one up from the library before but then had to return it unread b/c I’d checked too many books out to read in time before the due date. I’m glad to read your positive review of it. Like others, I find the idea of the imprisoned gods intriguing and also the worldbuilding in general sounds strong in this book. This was my second time checking it out from the library. (It often takes me multiple check-outs!) To me, the world-building is what makes this great.